2017 marks Repertory Philippines’ 50th year anniversary, and to celebrate the milestone, the theater company’s stars and acclaimed alumni will #ComeHomeToREP for the grand one-night-only musical extravaganza REP’s 50 Years of Telling Stories on June 11 at The Theatre at Solaire. It promises to be a great evening with REP actors, veterans, young actors, and alumni, including the likes of Monique Wilson, Leo Martinez, Arnell Ignacio, Joy Virata, Pinky Amador, and Cara Barredo, pooling their talents to tell the story in song, dance and visual history. REP’s 50 Years of Telling Stories is directed by Bart Guingona, Jaime Del Mundo, Miguel Faustmann, Audie Gemora, Menchu Lauchengco-Yulo, Raymond Lauchengco, Freddie Santos, and Michael Williams, with musical direction by Ejay Yatco, and writing by Luna Inocian. 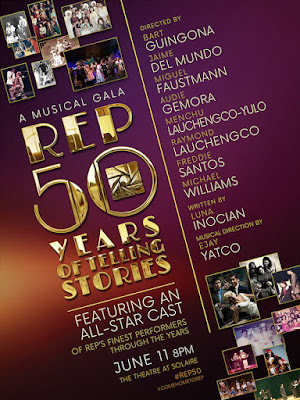 Don’t miss REP’s 50 Years of Telling Stories on June 11 at The Theatre at Solaire. Purchase your tickets by calling REP at 843 3570 or Ticketworld at 891 9999, or log on to www.ticketworld.com.ph.